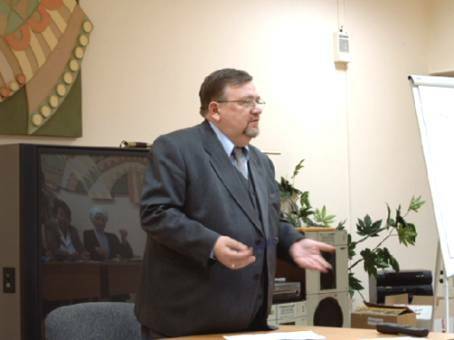 to Oppose Racism and Xenophobia in Russia"
The conference on �The Task of Ethnic Associations to Oppose Racism and Xenophobia in Russia� was carried out by the Center for Interethnic Cooperation at the country boarding house �Vyatichi�, 100 kilometers outside of Moscow. Forty-two leaders of Ethnic Associations took part in the conference, representing twenty-one regions of Russia (for a list of participating organizations and regions, see Appendix), as well as representatives from federal and Moscow authorities. Also at the conference was Katie Leech, First Secretary of the British Embassy, and Guillermo Martinez, Chairman of the Moscow office of the European Union�s Program for Support of Democracy and Human Rights. The conference began on the next day - June 21st, at 11 a.m. After a short speech � by Ashot Airapetian, the director of the Center for Interethnic Cooperation, the floor was given to Katie Leech. Ms Leech began by saying that racism and xenophobia are the problems of all European countries � that demand serious work in order to be solved. She firmly believedthat the participants of the conference would thoroughly discuss the existing problems. She also wished them success in their debate. Next, Guillermo Martinez gave his speech. Taking part in the conference could have been difficult for him because it required a lot of patience and strong nerves, since sometimes the participants try to convince each other not by arguments but rather by the timbre of their voices. Mr. Martinez emphasized the importance of problems of an opposition towards racism and xenophobia in the modern world. He also noted that the European Union made the struggle against racism one of the priorities of its Program for Support of Democracy and Human Rights. He spoke in detail about a new contest of microprojects, which was carried out in Russia as a part the mentioned program. After that, an anonymous survey was distributed among the participants of the conference. The survey showed that the majority of the chiefs of ethnic associations believe that interethnic relations in their region are satisfactory. Thus, only half of them think that these relations are satisfactory in Russia as a whole, whereas the other half consider the situation tense. It turns out, that there are some regions where interethnic relations are much tenser than average in the country. This has a negative influence on the rest of the country. It is probably simple to guess in which regions the situation is uneasy, since different kind of organizations mention these problems in their publications several times. The places where the situation is most difficult are Moscow, the Krasnodar region, and St Petersburg. The other question of the survey referred to responsibility for the state of interethnic relations. Most respondents named the federal authorities as the ones responsible. The local authorities and the mass media received two times less votes. It was also found that the role of law enforcement bodies in the interethnic relations is perceived as either negative or very negative. In contrast, in most European Union countries, the role is seen as rather positive. On the other hand, the majority of our society has same negative opinion of law enforcement bodies in Russia. Unfortunately, our law enforcement bodies turn out to be lawbreakers. So, not only are they a threat to migrants, they are a danger to the whole society. The vast majority of the chiefs of ethnic associations believe that the mass media�s role in interethnic relations is negative. 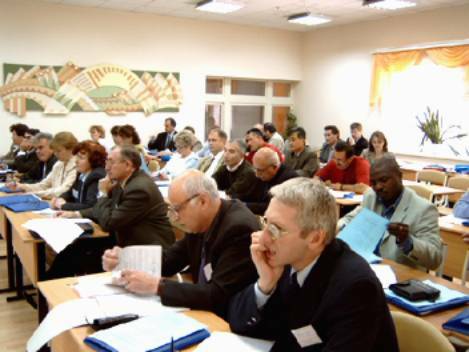 The Center for Interethnic Cooperation has carried out the surveys since 1998 and since then the attitudes of the chiefs of national minorities in Russia towards the role of the mass media has not changed. Because of dependence from the authorities and the business, mass media behaves like a scared animal; bites everyone not caring about who is right and who is wrong. � It is characteristic that every second chief of national association thinks that the work of right protection institutions in the field of protection of the rights ethnic minorities is either negative or doesn't exit. 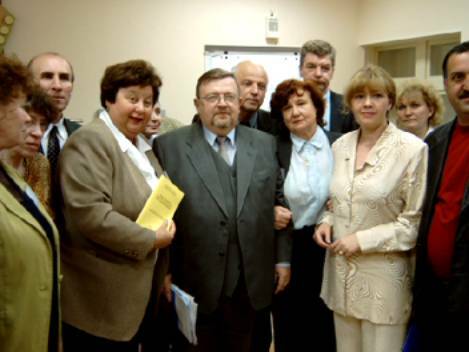 The Centre for Interethnic Cooperation repeatedly declared, that most of the members of right protection institution, in contrary to their colleagues from the European Union, prefer to do their job in their peaceful offices, taking interest in process of work instead of results. During the conference the chiefs of ethnic associations were asked whether they closely cooperate with right protection institutions. Only a few said they do it. It is clear, that the chiefs of the associations themselves are somehow to be blamed for the situation. On the other hand, the right protection institutions receive grants, while the ethnic associations have to provide their own sources, and their main task is to preserve the ethnic culture and language. The majority of the participants of the conference noted that appearance of fascist/racist group such as skinheads was possible because of indifference of the authorities. This year, there were no incidents during the anniversary of Hitler�s birth thanks to preventive measures that had been taken by the authorities in advance. The participants didn�t have a chance to finish the survey as the Minister of National Affairs, Vladimir Zorin, arrived. Since he also had received the incorrect direction it took him some time to get to the country boarding house �Vyatichi�. However, he gave his speech just right after is arrival. He warmly welcomed everyone and encouraged the participants of the conference to express their opinions. ��������������� There were of view speeches and lectures given by David Beritashvili - �Georgian Association�, Moscow, Adam Kalayev - the Society of Chechen and Ingush Culture �Vainakh�, Ekaterinburg, Oleg Radevich - The House of Ethnic Cultures, St. Petersburg, Victor Seleznev - Don Cossacks� Volgograd District, Oleg Georgizov - the Center of Ethnic Cultures, the Society of Assyrians of Kuban �Khadyata�, Krasnodar, Victor Ditz - National and Cultural Autonomy of Germans of Tatarstan, Kazan, Oleg Kuznetsov - �Russian Rebirth�, interethnic council, Tula. All of the speeches were interesting, sometimes emotional but never trivial. They were very closely connected with the carried out survey. The Minister of National Affairs listened to everyone carefully and when he got a chance to reply he had detailed comments on all the issues. After that, he answered to many questions of the chiefs of the participating associations. The discussion was very interesting. The Minister took all the questions really seriously and dealt with them very professionally. Fortunately, he didn�t behave as most of our officials who often act as if they were smarter then others or knew everything better. Because of his attitude, he immediately became popular among the other participants. Eventually, the discussion smoothly moved to the problem of improvement of interethnic relations in the country. After a few hours of discussion, it was obvious that a consensus between representative of the state and representatives of national minorities was reached. This achievement is a very impressive one, since such things do not happen often here. Because of that, the participants did not feel like letting the Minister leave. So, the organizers had to change the schedule a little bit. And even after Vladimir Zorin�s departure everyone kept discussing the issues mentioned in the earlier debate. 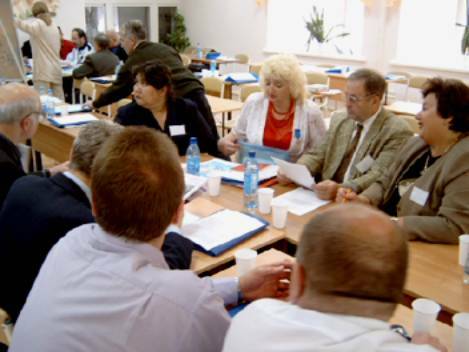 The participants came to the conclusion that it would be necessary to have such meetings more often in future; in order to have an opportunity to discuss different issues with representative of authorities and the representatives of authorities would have a chance to get familiarized with the special needs of ethnic/national minorities. �After lunch, the participants split into working groups. Each of the group worked on different issue. It was necessary to create 5 working groups so that there would be enough groups to cover all the interesting topics. Everyone worked until 6 p.m. Then, the participants had an opportunity to watch a movie �Multinational Petersburg� produced by Etnos Studios. The movie was shown by Oleg Radevich the director of The House of Ethnic Cultures from St. Petersburg. Before showing the movie Mr. Radevich talked a little bit about the authors of the film and about their future plans to continue their work. The movie was the last thing on the schedule that day. After it, all participants had a chance to get acquainted with each other, to talk to each other and this might be very useful in their future work. The next day, the participants worked in the same working groups again. They came to certain conclusions. The participants of a conference noted, that the relations between ethnic associations and authorities are necessary for preservation of cultural and national identity of the national minorities and ethnic groups living in Russia. They also decided that the ideas of tolerance should be promoted in the society. The cooperation with the authorities would also help to protect human rights, fight racism, xenophobia, and extremism in Russia. During the conference, the participants also noted that good relations with the authorities exist only thanks to the ethnic associations, because the authorities are either passive or do not pay enough attention to the problems of ethnic/national minorities. In the relations between authorities and the associations, the authorities tend to be selective and often use double standards. The local authorities seem not to understand that the society can gain some benefit from their cooperation with ethnic organizations. As far as the federal authorities are concerned, they are to far away from the regional problems and there is no real dialogue between them and the ethnic NGOs. But even worse then that is that there are not legal regulations dedicated to protection and support of rights of ethnic and national minorities. Moreover, the war in Chechnya has had a very negative influence on interethnic relations in Russia. The chiefs of the ethnic associations complained that Militia and the Migration Service often abuse their authority while dealing with members of ethnic or national minorities. There are also not enough well-qualified people who could cooperate with ethnic associations. Their activities do not help to improve the relations between minorities and the society. There have not been established the mechanisms of interaction between the Migration Service and Militia, so the situation is constantly worsening. The participants of the conference also think that the appearance of racist and xenophobic views in the society is caused by socio-economical problems in Russia, the passiveness of the authorities, and inefficiently organized work of the state. To some extend, the NGOs contribute to the situation because they are often unorganized and their actions do not receive much publicity. In conclusion, unprofessional approach the authorities on federal and regional level has a negative influence on interethnic relations. Therefore, in order to improve to the situation, it is suggested that Public Interethnic Councils should be created to cooperate with the authorities. 2. Ways of influencing public opinion. The chiefs of national associations believe that journalists will refer in their materials to non-Russians in a more positive way if they have access to objective information about the members of national/ethnic minorities and they know more about work of ethnic associations. This can be reached by studies and constant analysis of the mass media activities, which should help to find an optimal way of cooperation. The participants of the conference noted that the role of the mass media in creating the image of national/ethnic minorities in Russia is huge. But the mass media often convey the principles of the authorities. It is not a secret that most of the mass media is controlled by the state, so whenever the chiefs of national associations want to improve the image of national minorities in press and television, they turn to the authorities and ask them to run the policy directed at consolidation of ethnic and national minorities. 3. Interactions with other organizations. The participants of the conference noted that there is a great need for close cooperation between different organizations. However, they think that it is more important to develop cooperation between non-government organizations on local level rather than on local-to-federal level. The chiefs of ethnic associations drew attention to the fact that the work of legislative bodies directed at fighting racism and xenophobia is inefficient. Nevertheless, it is better to cooperate with the authorities than to work together with fascist or nationalist groups such as skinheads, since working with extremists is pointless. The Council is going to be made of two chambers. The first chamber will consist of chiefs (or their proxies) of ethnic associations, which are officially registered and recognized by the federal authorities (such as Federal National Cultural Autonomy, and others). 89 leaders (or their proxies) of regional ethno-cultural associations from all over the country will make up the second chamber. The Minister of National Affairs will head the Council. �The Council will monitor interethnic situation in the country. It will also prepare research papers on the topics related to the problems of protection of rights of national and ethnic minorities. ��������, Additionally, the Council will propose their own legal regulations in the fields concerning the minorities. It will advise the government on the issues related to the interethnic conflicts. At the end of the conference, the participants issued a statement. To the political parties and candidates in the deputies of the State Duma of the Federal Assembly of the Russian Federation. We, representatives of Azerbaijans, Assyrians, Armenians, Bashkirs, Belolorussians, � Georgians, Jews, Koreans, Kazaks, Kazakhs, Lithuanians,Maris, Germans, Poles, Tadjiks, Turkenians, Tatars, Uzbeks, Ukrainians, Chechens, Chuvashs, and of national associations from Moscow, Ekaterinburg, Yaroslavl, Astrakhan, St.-Petersburg, Volgograd, Nizhni Novgorod, Krasnodar, Kaliningrad, Cyktyvkar, Samara, Tula, Rostov-on-Don, Stavropol, ���������, Orenburg, Novosibirsk, Chebokar, Kazan, Omsk, Saratov, Voronezh, Ufa reflecting the interests of our nations, we believe that the effective realization of state national politics that place importance on the interests of citizens of all nationalities, is of particular importance, not only for national minorities, but also for the stability and prosperity of all our multinational federal state. 1. To preserve the culture and languages of all people of Russia. 2. To counteract ethnic extremism, and the national discord and intolerance connected to it. 3. Legislatively to introduce community organized education programs that will teach respect for the cultural and religious differences between citizens of Russia. 4. To achieve a legislative reformation of the selection system with the purpose of maintaining representation of various ethnicities, both in the State Duma, and in legislative bodies of the Federation. At 16.00 the participants of a conference left the country boarding house "Vyatichi" by bus and were taken to Moscow, and so the leaders of national associations returned to their regions. As a result of the two days spent at the conference, the participants found many new friends and were able to discuss vital questions. At the closing of the conference, the participants assured the organizers that they would like to continue this work and hope for further cooperation. And we shall try everything in our power to realize their hopes. The Culture Center �Vainakh�, Consulting Council on the National Affairs of the Sverdlovsk Region, Society of Chechyan-Ingush Culture �Vainakh�, European National Association, Regional Public Organization of Uzbek Culture �Uzbekistan�, Regional Society of Turkmenian Culture �Vatan�, �African Union�, House of National Culture of Saint Petersburg, Regional Society Organization �Volgograd district of the Don Cossacks�, Tatar Culture Center, Society of European Culture �Tsvi-Girsh�, Tatar Culture Center �Yaktashlap�, Center of National Culture, Society of Assyrians of Kuban �Khayadta�, Society of Georgian Culture, Regional National-Cultural of the Autonomy of Lithuanians of the Kaliningrad region, Ukrainian National-Cultural Autonomy "Batkivshchina", National-Cultural Autonomy �Belarus� in the Republic of Komi, Tajik National Associations, Mari National Association, Society �������� � ������, �Russian Rebirth�, Kurdish National Association, Society of Russian Germans "Vidergrebyrt Don�, Regional National-Cultural Autonomy of Germans of Stavropol �Vidergrebyr�, Cultural-Enlightening Society ������-����, Polish Society of Cultural-Educational Center �Czerwone �aki�, Belorussian National Association, Regional Jewish National-Cultural Autonomy, Mari Culture Center, National-Cultural Autonomy of Germans of Tatarstan, National-Cultural Society of Bashkir, Regional National-Cultural Autonomy of Germans , Armenian Community ��NI�, National-Cultural Autonomy of Koreans, Society of Chuvash Culture, Association of Ukrainians of Russia, "Georgian Association", Tajik Culture Center, Moscow Regional NGO of Kazakhs. Ekaterinburg, Yaroslav, Astrakhan, Saint Petersburg, Volgograd, Nizhny Novgorod, Krasnodar, Kaliningrad, Syktyvkar, Samara, �ula, Rostov-on-Don, Stavropol, Orenburg, Novosibirsk, Cheboksarpy, Kazan, Omsk, Saratov, Voronezh, Ufa, Moscow.